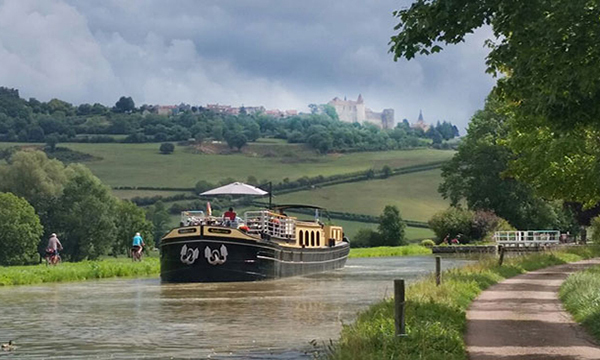 Saint Louis cruises deep in the heart of untouched France on a postcard-perfect route in the ancient area of Gascony. Offering an inventive and distinguished cruise, the experience and expertise of her Irish team of owners/operators, Tour Guide Peter and Captain Wendy Carrington, shines at the forefront of the Saint Louis’ splendid barging experience. A lifelong gastronome, Peter continued to pursue his personal passion for culinary excellence while working in fashion retailing. It was at this job where he met Wendy, a fellow creative soul and enthusiastic epicurean, with an accomplished background in art and design. These two combine the classic components of canal cruising with a modern perspective toward regional cuisine, wine appreciation, and guided excursions. Their commitment to relaxed lifestyles and everyday luxury is evidenced by the barge itself, as it has been recently redecorated by Wendy in a light and airy style. Soft color schemes of pale gray, rich cream, and dusty blues are united by gleaming wood accents, while the cabins provide soothing havens of quiet comfort and really fabulous bathrooms. Extending to the onboard dining program, their innovative approach has been especially well received by discerning foodies. Locally sourcing the freshest meats and produce are the highest priorities, and guests are welcome to join the Chef for a behind-the-scenes look at gourmet recipe creation, what goes into selecting the best wines for each meal, and even informal French cooking demonstrations. Wine pairings spotlight area vineyards with an emphasis on the iconic vintages of nearby Bordeaux, and guests on the vessel enjoy a signature visit to the famed wine town of St Emilion for a special tour and tasting at a private cellar. Further explorations of the region’s artisan treasures include visits to area attractions, explanations of local landmarks, and private spirit samplings. Craft cocktails are also an onboard specialty…here is an exclusive recipe for their signature drink! In the afternoon, you will be met by a crew member of the Saint Louis at the designated meeting point. 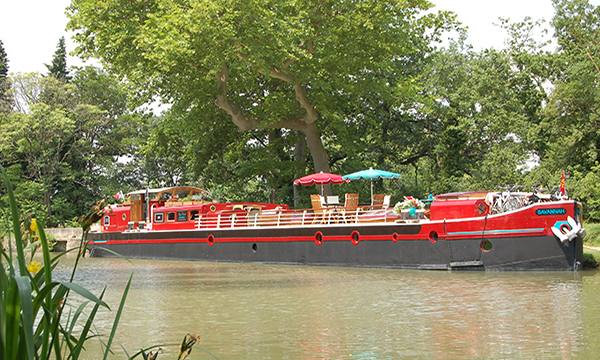 From here, relax as you are chauffeured to the barge, moored at Serignac. A traditional champagne welcome and introduction to the crew awaits you, before your first gourmet dinner onboard. Relax with a cup of freshly brewed coffee or tea on deck this morning as Saint Louis lazily cruises through the most serene of landscapes. This afternoon, your Tour Guide introduces the Latour-Marliac Lily Gardens, where thousands of water lilies are on display. This garden inspired and provided Monet with lilies for his own gardens at Giverny. Return to the barge for canapes and cocktails before enjoying another gourmet dinner. Tour and taste this morning during a visit to a fourth-generation producer of Armagnac, the region's iconic brandy. After sampling this special spirit, select a year which signifies an important event, and watch as your own personal bottle of Armagnac is drawn from your chosen barrel, corked, and sealed. Your Tour Guide then returns you to the Saint Louis for an afternoon cruise, offering the perfect time to explore the towpath by bicycle or on foot. Or, feel free to join Chef for informal cooking demonstration before tonight's dinner. This morning, your Tour Guide accompanies you on a tour of a privately owned natural history museum. The owners offer a guided exploration of their unique collection of fossils, minerals, and semi-precious gems from around the world, carefully collected over 50 years of travels. Return to the barge for an afternoon cruise, stopping at the quaint town of Mas d’Agenais for a visit inside its church, where there is an original Rembrandt painting of Christ on the Cross. Then, cocktail hour precedes another multi-course gourmet dinner. A morning cruise gently winds through gorgeous vistas and bucolic scenery. Relax on deck, or explore the towpath with a gentle pedal or leisurely stroll. This afternoon, enjoy a private visit to Chateau d’Arche, one of the top producers of Grand Crus Sauternes. Characterized by the balance of sweetness with the zest of acidity, these wines offer a lingering finish, resonating on the palate for several minutes. Return to Saint Louis, which will have moved to tonight's mooring at Meilhan, for another lovely evening of drinks and dinner. Explore St. Emilion, the most charming of French wine towns. 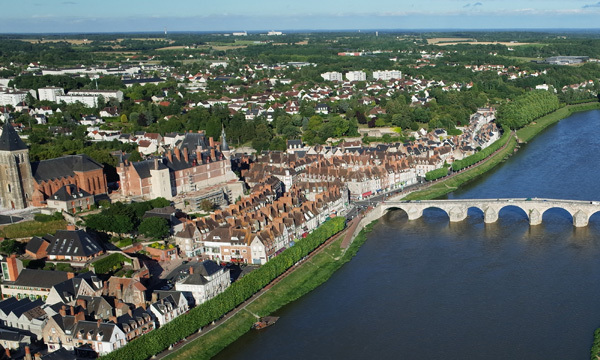 Discover a 12th century underground church, and then enjoy luncheon ashore at a local bistro. The afternoon is spent with Saint Louis' negociant for an exclusive tasting of hand selected Grand Crus Chateaux wines. Complete the cultural immersion with time to browse St Emilion's shops and boutiques. Then, your Tour Guide returns you the Saint Louis for an evening cruise to Castets-en-Dorthe before tonight's celebratory Captain's Dinner, served onboard.